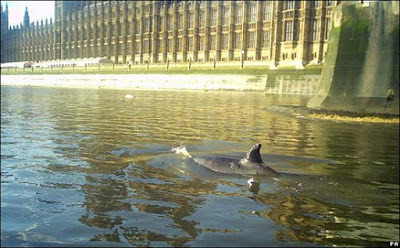 In what must be one of the more interesting news stories for a while, a whale has been seen wondering up and down the River Thames. How did it get there? Is it lost? Has it run away from home? More from the BBC here. Whatever the reason it has caught the attention of the whole office here with people crowded around the closest television. And as I type, the whale seems to have hit land. It's struggling and appears uncomfortable with something red, possibly blood, appearing in it's vicinity. What will happen? Gripping stuff.